This is the most recent information about Paper Lace that has been submitted to amIright. If we have more information about Paper Lace, then we provide a link to the section where it appears (the actual page whenever possible). "The Night Chicago Did" originally "The Night Chicago Died"
"The Back-Eyed Boys" originally "The Black-Eyed Boys"
They have eyes in the back of their heads?! "Can You Get Lit When You Want It" originally "Can You Get It When You Want It"
"Can You Get Bit When You Want It" originally "Can You Get It When You Want It"
"Can You Get Wit When You Want It" originally "Can You Get It When You Want It"
"Can You Get Fit When You Want It" originally "Can You Get It When You Want It"
"The Night Chicago Dined" originally "The Night Chicago Died"
"The Light Chicago Died" originally "The Night Chicago Died"
But the heavy or dark one lived on? "The Right Chicago Died" originally "The Night Chicago Died"
But the left or wrong one lived on? "The Tight Chicago Died" originally "The Night Chicago Died"
But the loose one lived on? 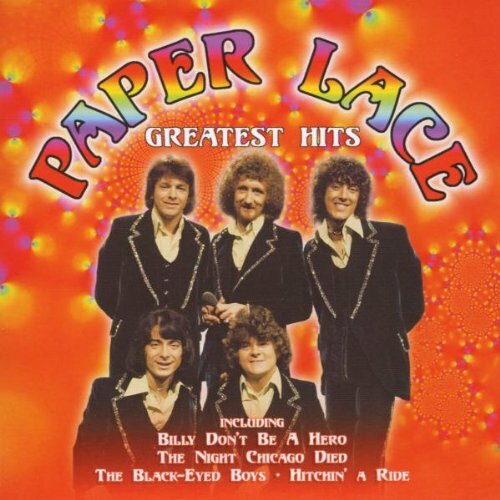 Paper Lace Where Were You The Night Chicago Died? There are additional Paper Lace Combined Groups that haven't been done yet available. "Billy, Don't Be a Hero"
The night she coughed and died. While driving us home from school, my friend's mom said, "that's a tragic song, The Night She Coughed and Died." Daddy was a cop on the East Side of Chicago. This would place daddy's precint somewhere in the middle of Lake Michigan! I heard her pray the night Chicago died. 'Bout a hundred cops are dead. The law-breaking, cop killing 1920s set to a lively jazzy beat. That's the last thing Chicago needs to be reminded of.